Since this is a very large article, I suggest reading few tips at a time & practicing them. Consider bookmarking this page so that you can refer to these wonderful ideas when you are wrestling with a sluggish workbook. Please note that I am not able to share some of the files you emailed as they contained personal / sensitive data. I use Formula-Calculation Options-Manual to disable calculations when setting up complex inter-relating formula pages. This stops Excel from churning through calculations every time I change a cell, saving my time. I just hit F9 to recalculate when I want to see the results. so I can see the status of my macro and estimate how long there is left to calculate. Don’t forget to switch these back at the end of the macro! When I have complex formulas with results that won’t change, I hard-code these to save calculation time, but I keep the formula only in the first cell, or pasted in a comment. In spreadsheets that have vlookups, if the source file is not going to change; I have realized that it is better to paste-special the vlookup values. This is because even a couple of vlookup slows down the file massively on account of recalculating of values. Another step I take (this depends on the criticality of data and other factors) is to set the auto-save function in excel to an infrequent duration. Replace sum products with count ifs or sum ifs where possible – they calculate a million times faster!! Avoid large number of SUMIFS, instead, aggregate data into a PivotTalble, then use the Index(Match) combo to locate the sums. I have dramatically sped up large worksheets doing this. 1. Change Calculation to Manual mode. Calculate manually only when required. 2. Delete all name ranges, unused area, unnecessary formatting. 1.) Avoid array formulae, where possible. Everyone knows there are a million ways to skin the proverbial Excel cat. Find alternatives to array. 2.) Adjust the calculation options, if necessary. Frequent calculations = sluggishness. A word of warning, though – people need to know if calculations aren’t automatic, or it can/will cause confusion. 3.) If all else fails, copy and paste as value. If the recipients of your data don’t need the flexibility to enter new data and update values with calculations, take formulae out of the equation (no pun intended) all together. I replaced all my SUMPRODUCT formulas with SUMIFS and calculation time went from about 50sec to instantaneous. My system is a AMD 6 processor with 8gig memory, Excel 2007. Stay away from array formulas (unless to have calculations on Manual). Sometimes in a workbook you have so many formulas that for effective work you have no other choice but to turn off the auto-calculating. Still you work on your workbook, writing new formulas, there is no problem if you just wrote one formula in one cell – it can be calculated by just F2-Enter combo. Problem is when you created a new formula for a whole column – you don’t have to calculate whole workbook now or “F2-enter” every cell – just select the column you want to calculate, Ctrl+H and change “=” for … “=”. It’s a known trick, still some people may not know it yet. Cheers. PS. I don’t work on English version of Excel so my translations may not be accurate. I use templates with formulas in them that I add data to every month, and once I paste the next months data I copy down the formulas recalculate and then copy and paste the formulas except for one line of formulas for next month. In this way my spreadsheet of 200-300k & growing lines doesnt have to recalculate all the rows everytime. I set the Automatic Calculation option to manual make any changes in Excel and then hit F9 to calculate as and when required or set back to Automatic once I have completed any large or slow spreadsheets. Save me so much time and frustration. 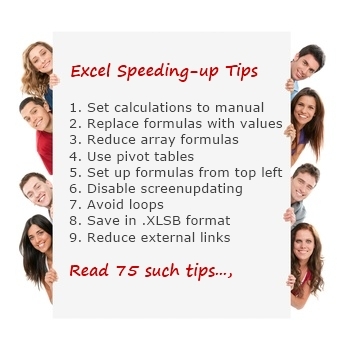 I would love to hear any other tips on speeding up spreadsheets. Cut down on the use of Array formulas – particularly if they are nested in IF statements. 3 When using the Rept formula use “l” which is L in small caps and then type the number of times you want to rept. another use of rept formula is to use it for confidence interval with mean in the middle. Vlook up will look up the name and will return the phone number. If we have phone number and want the name then we need to write a match and index, Instead if you copy name and phone next to each other then for the phone number vlook up will return the name. That is easy. 1. If you need to turn off recalc, it is time for a redesign. 3. Avoid VLOOKUP, especially on large tables, instead, use INDEX combined with MATCH, where you use a helper column for the match so you only ask Excel to search your table once for each row instead of once for each column in a row. 5. Be prudent with range names. Use them sparingly and limit them to constants. Formulas with range names are harder to audit because of the extra layer between your formula and the grid. 6. Visit www.decisionmodels.com, the site contains a wealth of information on recalculation in Excel. I work with files that use a lot of data tables. In order to avoid excessive delays I will turn off the automatic setting under calculation options and select automatic except for data tables. In addition, I have noticed that excessive conditional formatting can really bog down the spreadsheet as well. Thus, I try to limit and consolidate formatting needs where I can. Use as many array formulas as possible on the staging worksheet. That way the Excel or UDF functions are called as few times as possible. The way I speed up my workbooks is by pasting values (instead of keeping the formulas) once the data is no longer going to be updated. For example, I have files that track activity that has happened each quarter. The sheets often have 35,000 rows of data and formulas in each of the 10 columns (for each row). As soon as the quarter is over, I paste the values over the formulas since things won’t be changing any longer. Perform paste down macros for all calculations. These use dynamic named ranges to select a row of formulas, then paste them in against a table of data. This way you can calculate formulas against thousands of rows and then copy-paste special with values. Removing live formulas seriously reduces calculations times for workbooks with 1K+ rows of data. Perform Sorts and then use range formula (OFFSET, INDEX) to select a subset of rows, rather than using conditional formula on whole columns. SUMIF, COUNTIF, array formulas etc are very slow on big columns of data. Sorting can filter a table to records that share the same attribute and range formulas can pick up row numbers to only select a sorted block of values. Keep use of array formulas to a minimum. Keep calculations running sequentially from top left to bottom right when possible. Break up larger internal formula calculations into smaller bites (more columns etc). Look for formula parts shared by formulas. Use offset to keep lookup formulae to the minimum required ranges. Use built-in formulas whenever possible. I work with large workbooks with extensive formula throughout. I used to use VBA to paste in formulas then I would value them out, but my clients couldn’t easily modify the formulas if they desired a change. Since then I would place a formula row at the top of the data and use VBA to copy that row and paste formulas below, calculate then value them out. The client can then modify the initial row of data to suit their needs. This greatly improved save and load times. When I have thousands of rows of equations (all the same), I convert all but the top row to values. Then I create a macro that spreads the equations from the top row down to all the necessary rows and makes them values again. Saves a lot of excel recalculating. I have Excel 2003 files of 45 Mb plus that track daily shift performance that have lots of vlookups, conditional formats, data validation, event triggered VBA. To speed things up I cheat! The historic data is copy-special pasted over itself to turn it into values only – so when auto updates happen they only process the “current data”. Tips for Formula speeding up by Mark W.
Once my formulas have all calculated and I know the the results won’t change, I copy the formula and put it at the top of my spreadsheet. Then put a red top & bottom border around the formula so I can easily find them. I then copy the data set full of formulas and re-paste it on itself (keyboard shortcut – copy/file/paste special/values). The spreadsheet calculates much faster. When I need to update the data I just copy the row of formulas and paste them over the data rows. 1. Define name of ranges and Use it in the Formula if data is flowing from database. Linking all my dashboards with pivot tables and queries for to update complex data with one click. My array formulas used to reference an entire row or column (e.g. A:A or 1:1), and I’m pretty sure that slowed down the sheet. I shrunk the reference to go through, say, row 5000, and it appears to have helped the problem. Lean to us e database functions. They are very easy to use and are often much faster than their Lookup & Reference counterpart. If my model has lot of formulas in the data sheets and working on the summary tab – then I will Keep my formula calculation option as “Manual”. If you are doing calculation in one sheet Pls use Shift+F9 (to get refresh the formula in the active sheet). F9 – to refresh the complete workbook. First. I find your site awesome. and then setting those values back to whatever they were before I made the changes. I do EnableEvents when I use a Event Driven actions and I know that I do not need them during those calculation/operations. a) Profile both worksheet calculations, and if necessary VBA code using the profilers downloadable here to identify and report on slower performing calculations and code. b) in VBA, always abstract data from the worksheet and work on the abstracted object model. We design macros which we run across the many worksheets. If formulas are generated, we do final macros to save the formula results as numbers. This retains our worksheets as light. 1. Disable screen updating in VBA. 2. Set calculation to Manual, use Shift-F9 to calculate each sheet as needed. Is a pain, but I have found it is a major time saver on a couple of my largest files. Recently, I’ve been busy with a project to emulate software for seeking secret messages in classical texts using EXCEL. I need to write hundreds of thousands of single letters each in a cell, and I’ve found it faster to operate internally VBA and finally write as a block in a declared range, rather than doing it via a loop writing individually each cell. I haven’t measured times, but I would venture it’s a lot faster. Just thought to share this as you asked for – considering all the entries I have seen from others on your website, I am just a newbie in the Excel World. VBA: One powerful one is to use “Destination:” in your copying and pasting which bypasses the clipboard. Or if only values are wanted simply assign values. Avoid loops like the plague while writing macros, unless absolutely necessary. A tip which is well documented when searching for ways to improve performance when using VBA/Macros is to turn off screen updating, calculations and setting PivotTables to manual update. Passing the entire SQL query into the code, leaving no connection on sheets. This is a very general tip, but when using VBA — AVOID LOOPS! Use the “Find” and “Search” methods rather than looping through cells. Loops work quick when you are using less than 100, or sometimes less than 1000 cells — but start adding more and you will be in for a waiting game. If you have VBA code that writes updates to the screen, this slows down the code (I/O is slow). If you have a lot of screen writes, the code can be painfully slow. You can turn off screen writes while your code is running and then do one massive screen write at the end of the macro. Up at the beginning of your code, maybe just after you declare variables, add the line “Application.ScreenUpdating = False”. At the end of your code, you need to turn screen writes back on so add the line “Application.ScreenUpdating = True” just before you exit the macro. If you have a load of screen writes, the speed difference can be dramatic. 1. I list out the things required and will imagine the plan of my task. 2. I try to minimize the calculation for speedy calculation. So, I am trying to learn new formulas. 3. In each and every step, I consider about the others who use that excel. So that I can make the workbook user-friendly to others also. I close MS Outlook when working on heavy files. Basically I exit all the programs that will eat into process speed. It helps to an extent. Also, I try and minimize cross linking of files. Power Pivot from Microsoft. This looks like it would solve the problem of large amounts of data. I haven’t done this myself, but a consultant we used sped up our dashboard by writing VBA code which “dumped” a lot of the back data after it was loaded. This greatly reduced the amount of data stored, thus reducing file size, thus sped up the dashboard. 1. Many database download from whatever system may include blank data occupying cells from the last row of data to the last possible row Excel can provide. So I would look at the data set and delete those rows (or columns, but I see more blank rows than blank columns). a) no need to maintain: I’d delete. b) need to maintain but may not be in a pivot table. I’d convert pivot tables into just text/data (thereby removing the pivot function) table. 3. Try to reduce the number of worksheet. I found out that the size of a workbook (I can’t prove it but it’s my general observation) would expand if there are more worksheets. Standardize, standardize, standardize! The more you are “boring” the quicker it will be to set up work with (and have others) use your formats! Oddly enough, the best thing I have found to speed up Excel is to completely disconnect internet access for my computer. I don’t know why, but Excel is unbelievably slow when I am otherwise online, and speeds up immediately when I disconnect. I’d love it if someone could help me understand why this is the case. I’m not an expert but try to keep the dashboard as much simple as possible. I break any links to the spreadsheet that I am not using. Dumping out as much unnecessary data as I possibly can, converting formulas to values whenever possible and making sure the empty space on each sheet is empty. Also I’m using lots of pivot tables on my spreadsheets so I’m trying to use as few pivot caches as possible and trying to use external data sources for my PTs whenever possible (or deleting the original data once the PT is created). I have Liked based models. I try to make my links as small as possible. I try to put all the sheets in one file and interlink them so that they take less storage space and react much speedy in working. Create a view in SQL and set a scheduled task to run to generate the view before you update the dashboard. Do we get some SWAG for sharing?? I recently happened to work on a report which has 1.5 lac rows of data in 16 columns. The requirement was that in the main report as soon as a change is made say for a dept or month the numbers should accordingly change. I tried most known formulas like Sumifs, Sumproduct, Vlookup, Index and Match. How ever the calculation time these formulae took was much more compared to one formulae that I felt was the fastest in terms of calculation. That was Getpivot data. I basically used the “show all report filter” option in the Pivot options to generate summary data in around 500 tabs using the my base data. Then I used get pivot data formula in my report file. Though the file size was a bit huge still my formula get calculated almost instantaneously. One thing I like to do is minimize links between workbooks. Instead of using live links to import data I like to use import and export sheets. These are identical sheets on the origin workbook (for export) and the receiving workbook (for import). Values are calculated in the origin workbook and pasted to the receiver as values only. This gets rid of messy links and keeps spreadsheets smaller and tidier. One thing to be careful of is that if one changes the other has to change so they stay identical. Thank you again for your excellent material. me closing other spread sheets and unnecessary opened tasks in your PC helps. – remove external data links – better to import a large data table – or use an SQL statement if possible. 4)	Link multiple tabs using the same data to one data tab. Ie.. Dates, headers, etc…the links will eliminate having to update each tab. 5)	Extract only the needed data from the database (10 columns of needed data vs. 40 columns available data. 6)	If the Database report does not allow the user to choose what is exported, export the data, organized the needed data into a consolidated area (rows x columns), Copy & paste into a new tab and delete the original tab. Many people leave the original data in the file, which slows down the file and adds to the file size. 1) Don’t create different pivots from same data. Copy the old and slice into the new one. 2) Go to special –> Check Last known cell and delete unnecessary data and formulae. 4) Use excel tables as far as possible. To speed up workbooks, the reduction of formulas within the workbooks should be the main aim. – Do not start calculations on that data in the workbook which could have been done before, e.g. using formulas to split up the dates like mm-dd-yyyy, weekdays a.s.o..
– Split up the workbooks for different purposes (Dashboard for CEO, Dashboard for CFO a.s.o..). If the modeling is too complex, think of using a a (semi-) professional data ETL tool in between or use the additional add-ons like PALO or Pentaho available as open source to rise the power of multidimensional databases for your BI-tools. This can and will save time in calculating for the necessary functions of the workbooks. Stay with KISS (Keep it simple, stupid). I use name range for multiple pivots, basically the offset function, this not only speeds up my calculation but also reduces the size of the workbook. Between these 75 ideas & and previously written articles, we have covered a lot of optimization & speeding-up techniques. What are your favorite methods? How do you optimize & deal with sluggish workbooks? Please share your ideas & tips with us using comments. I see most are saying that array formulas are bad. But I thought that when you use array formulas it grabs all the data at once and performs the calculations in one fell swoop. At least that is how the UDFs that I created work. When I did the time test it was much faster that way. Maybe I'll go back and check to make sure my work is right, but that's what I did. When I work with array formulas I get a full column of data then work on that column and return a full column of data all at once. Which has shown to be much faster than the alternative. Anyone have special insights on this? Mixed feeling about this article, while I completely agree with you when you share everyone's points under their name giving credit to contributors, but at the same time I see alot of repeated tips and few those may not be applicable under all cases. (I may have sounded harsh). Some kind of sorting of tips were required than mere 3 categorization. (Tough ask, I know). Some really worthy and awesome tips get lost in occean. I would have been happy to read only non repititive tips and more like standard chandoo articles. 1. When using too many pivots - Disable data drilling option. This reduces file size, cache memory and speeds up file. 2. If your macro has used too many files for gathering input, close the file and open. This is also release or kill unwanted space in memory and speeds up. Again this can be achieved by macro to close self file and reopen same file, using timer function. Please do not count me negative. Hey, one thing that really speeds up VBA processing of data is to extract ranges into arrays & then working on those arrays. Arrays are a lot faster than using cell offset or any other method for working with a database. After you are done you can also paste the value directly into the range with one single command. This will speed up the macros considerably. OK, I tested it. My UDFs were faster as array functions (like a couple thousand times). But Excel's built in functions are faster when not doing arrays. Not sure this is the case for all situations. I can't help but to speak up. Deleting a PivotTable will not speed up your workbook. It will only reduce the file size. There is zero memory processing for a pivot table if it just sits there. Instead of destroying the pivot table, why not remove the redundant raw data. That would equally reduce the file size of the workbook, while keeping the pivot table functionality. Thanks a lot guys for your valuable tips !! Application.StatusBar = "Wait a second..."
If you find that Pivot Tables are becoming sluggish becomes of the sheer volume of tables there is a way to increase performance. By default (xls 2010) pivot tables are designed to autofit the data within the columns as well as preserving formatting. I discovered that unchecking these two options alone will exponentially increase performance. Right click on your pivot table(s) --->choose 'Pivot Table Options' -->Layout & Format' Tab --->uncheck two boxes at the bottom. Done! I worked on a massive spreadsheet and it had become very slow over time as I developed it. I tried stripping down more and more formulas by replacing with pasted values, removed all conditional formatting etc. In the end what finally did the trick was when I removed the last single SUMPRODUCT fomula. It changed the updating time after one change from 7-8 seconds to instantaneously. The SUMPRODUCT I had used the full columns, and if I put it to only look at rows 1-500 it was fine. (1) Instead of writing a lot of formulas to organise data, you can VLOOKUP() the data in a Pivot table, thereby combining the advantages of Pivot table and VOOKUP(). (2) If you have a range named ‘TotalTaxForTheCurrentFinancialYear’, then it is not compulsory to use this name when making the worksheet. Naming the range as ‘Tax’ or simply ‘T’ will be sufficient. The formula =SUM(T) will be shorter and easier to use. After completing typing all the formulas, simply edit the name of the range from ‘T’ to ‘TotalTaxForTheCurrentFinancialYear’, in the name box. The formula =SUM(T) will automatically change to =SUM(TotalTaxForTheCurrentFinancialYear). I don't write many macros and like most of you when doing a recalculation it sometimes takes forever. I have found that when I looked at my spreadsheet, I could determine which order of calcuations (by column) would produce the least number of iterations. So I wrote a macro to do my calculations on my terms. I picked the order of the columns I wanted to calcuate and it sped up my recalc 5-10X. I did this so long ago, I believe I used "expression .Calculate". You can view all the formulas in the entire worksheet quickly by pressing [ctrl] and [~] keys simultaneously. To view results, press the key combination again. i need help about excle lerning and reports making with dash bord i have no facility to join the on classes. I hit on a great time-saver: sort the spreadsheet data; if, for example, the same result was due to a lookup of Hotel Name (A column), Date (B column), and Room Type (F column), the formula (Z column) would be: "=IF(A2&B2&F2=A1&B1&F1,Z1,VLOOKUP(A2&B2&F2,LookUps!A:G,7,FALSE))". Check files for invalid range names, invalid links and names that aren't needed any longer. Clearing out some 200 old references in a template made the file open go from 30 seconds to 2. You can improve the speed by stopping calculation during changing cell value and after that you can enable it. please follow the link. If you want to highlight the content or result within a cell with colour, use content colour not cell fill colour. This make a large data sheet fast as full colour takes up more resource. There are already so many useful replies, so don't be mad at me if I repeat someone with the following hints. 1. Link (raw) data from external files, rather then building pivots in the same workbook of the data. => Reduces file size. 2. don't flag "keep source data" in pivot settings. => reduces cache. Downside is when you want to use slicers, you must allow refresh of the source data and thus people need access to that file. One extra when using tables above ranges: replace the table header references by cell references in heavy duty formulas. I'm not sure but it seems to be faster and lighter (in #MBs).